Summary and Definition: The Chumash tribe were a California tribe of Native American Indians who were hunter-gathers and fishermen. The Chumash tribe were located on three northern channel islands of the Santa Barbara, the coast of Malibu Canyon to Estero Bay and extended further inland. 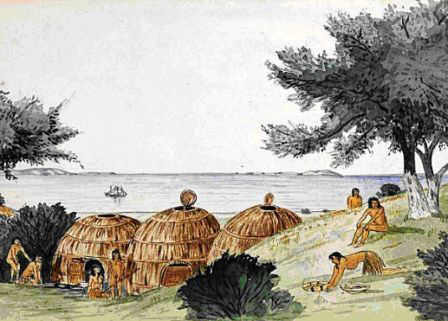 The Chumash people lived in well organized coastal villages of tule mat lodges, until the arrival of the Spanish who forcibly removed them to missions. What was the lifestyle and culture of the Chumash tribe? The ancient Chumash tribe occupied the southern coastline of California from 700AD and are noted for the many rock paintings, mostly found in caves in the interior of the Chumash land, that are considered to be some of the most spectacular in the United States. The Chumash lived in well organized villages consisting of well constructed tule mat huts and their territory encompassed 7,000 square miles. Santa Barbara was the central point in their lands which extended from the Channel Islands to Malibu up to Paso Robles and inland to the western edge of the San Joaquin Valley. The Chumash were the elite Californian tribes and their astronomers charted the night sky and had their own solar and star charts. The Chumash people were great fishers and constructed a distinctive type of planked, seagoing canoe, called a tomol. The length of the tomols measured up to 30 feet in length and were occasionally used for whaling. Smaller tomols were used for transportation and catching smaller fish. The Spanish invaded their lands in the late 1700's and forced the Chumash to convert to Christianity become slave-like 'Mission Indians'. The harsh treatment by the Spanish and then the Mexicans led to the short-lived Chumash Revolt of 1824. What language did the Chumash tribe speak? The Chumash tribe spoke in a Salinan-Seri dialect of the Hokan language family. The word 'Chumash' means "bead maker" or "seashell people". They were described by the Spanish as ”of good disposition, affable, liberal, and friendly". The six languages within the Chumashan language family were named after the missions which the languages were associated: San Luis Obispo, Mission La Purisima, Mission Santa Ynez, Mission Santa Barbara and Mission San Buenaventura. Where did the Chumash tribe live? The Chumash are people of the California Native American cultural group. The geography of the region in which they lived dictated the lifestyle and culture of the Chumash tribe. What clothes did the Chumash men wear? The clothes worn by the Chumash men were limited to aprons woven from grass or bark fibers. In the winter months warm clothing was needed made from the hides of animals such as deer (buckskin), elk, squirrel, rabbit, black bear and wildcats. The Chumash garments included fur robes, kilts or aprons, and leggings. They wore one-piece moccasins with long tops that were wrapped about the calf, but went barefoot in the warmer weather. The ceremonial crown-style headdresses of the Chumash consisted of a circular head roll that was made of bound tule and covered with fur. The central section of the headdress was made with a band of flicker feathers topped by feather plumes. Many Chumash people wore ear and nose ornaments as well as face and body paint, that was similar to the Mojave tribe. The paint was made use of black and white coloring often applied in horizontal lines, as can be seen in the picture. The white color was obtained from chalk deposits and charcoal was easy to make resulting in distinctive white and black face and body painting. What clothes did the women wear? The type of clothes worn by the Chumash women included aprons or skirts that covered the front and back made of shredded willow bark. Special clothes were strung with ornaments, tassels, shells and quills. Twined tule slippers or moccasins covered their feet and in the winter they wore fur robes for warmth. What did the Chumash tribe live in? Tule Mat Lodges: The Chumash tribe of California lived in shelters of dome-shaped shelters called Tule Mat Lodges. To build the tule grass houses, the Chumash men first created a circular willow framework. The size was about 7 - 10 feet in diameter and about 7 feet high - the chief's house was up to 35 feet across. The Chumash women harvested the long green stems of tule which were dried over several weeks. After the tule grass had dried, the women weaved and sewed the tule rushes into rectangular mats about 2 feet wide. The mats were sewn together with dogbane (Indian hemp) and tied to the willow frame. An opening in the roof created a smoke hole. The doors of the Chumash tule mat lodges always faced towards the east and were built near water. What food did the Chumash tribe eat? The food that the Chumash tribe ate varied according to the natural resources of their location. Their food included staple diet of acorns which they ground into acorn meal to make soup, cakes and bread. These great fishers used nets and harpoons to capture sharks and even whales. Smaller fish such as sea bass, trout, shellfish and halibut were primary food sources. The inland Chumash hunted deer (venison), elk, fowl, and small game such as rabbits and quail. The Miwok hunter-gathers collected other foods including nuts, mushrooms, various greens, roots, bulbs, and berries. Dried seaweed was considered a delicacy. What weapons did the Chumash use? The weapons made by the Chumash included the use of Obsidian that was abundant throughout their territory and was used to make arrowheads, spear points, harpoons, knives, and various tools and scrapers. Chumash History Timeline: What happened to the Chumash tribe? The following Chumash history timeline details facts, dates and famous landmarks of the people. The Chumash timeline explains what happened to the people of their tribe. 1770: Spanish settle on the territory of the Chumash. 1790's: The Spanish began raiding Chumash villages for converts forcing them to work as slaves in Spanish missions. Descendants of the Chumash live on the Zanja de Cota Reservation and the on the Santa Ynez Reservation in California.